Technical Note No. 134, "ING Bibliography 2002-2011". Technical Note No. 129, "ING Bibliography 2000-2001". Technical Note No. 124, "ING Bibliography 1999"
Technical Note No. 121, "ING Bibliography 1998"
Technical Note No. 112, "ING Bibliography 1997"
Technical Note No. 109, "ING Bibliography 1996"
Technical Note No. 101, "ING Bibliography 1995"
Technical Note No. 97, "ING Bibliography 1994"
Technical Note No. 94, "ING Bibliography 1993"
Technical Note No. 89, "ING Bibliography 1992"
Technical Note No. 83, "ING Bibliography 1991"
Technical Note No. 80, "ING Bibliography 1990"
Technical Note No. 77, "ING Bibliography 1989"
Technical Note No. 66, "ING Bibliography 1988"
Technical Note No. 62, "ING Bibliography 1984-87"
Publications that make use of data obtained as part of the ING Service Programme. Publications that make use of data obtained as part of the ING Override Programme. List of Nature and Science papers. 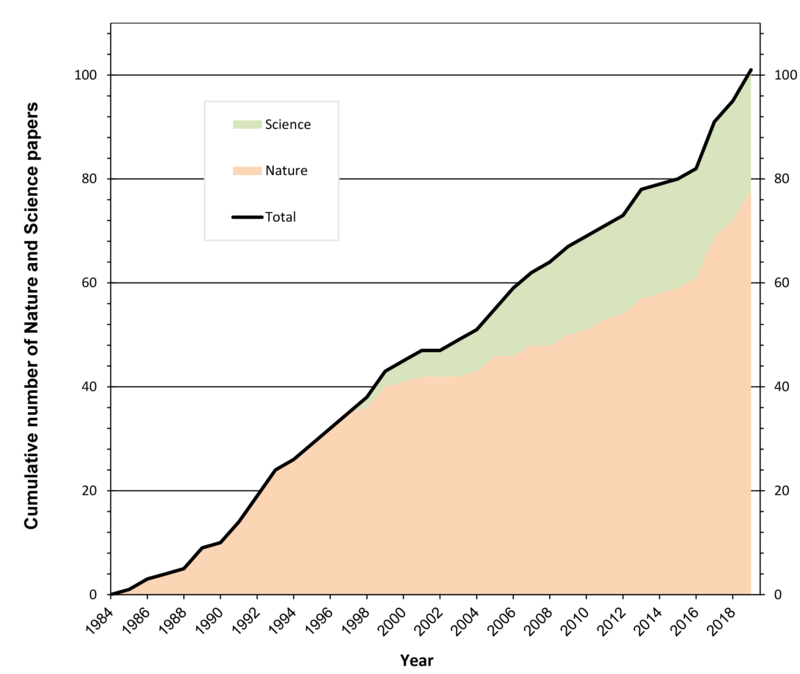 Cumulative number of research papers based on ING data published in journals Nature and Science per year [ PNG ]. This table shows the refereed-paper counts per telescope and year. 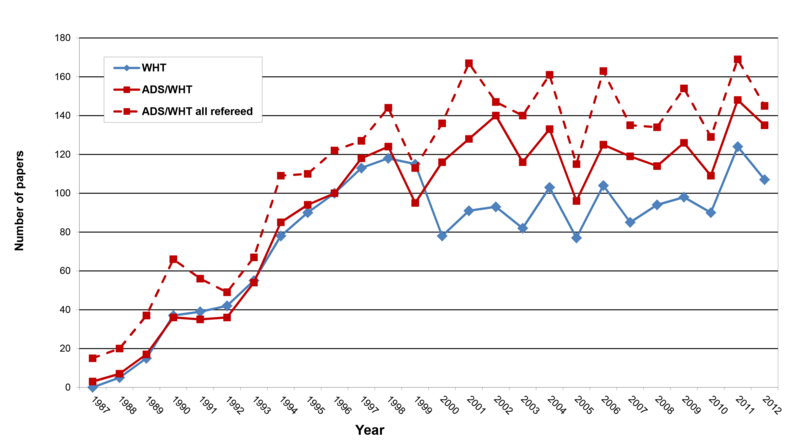 Number of refereed papers per year from first light [ PNG ]. 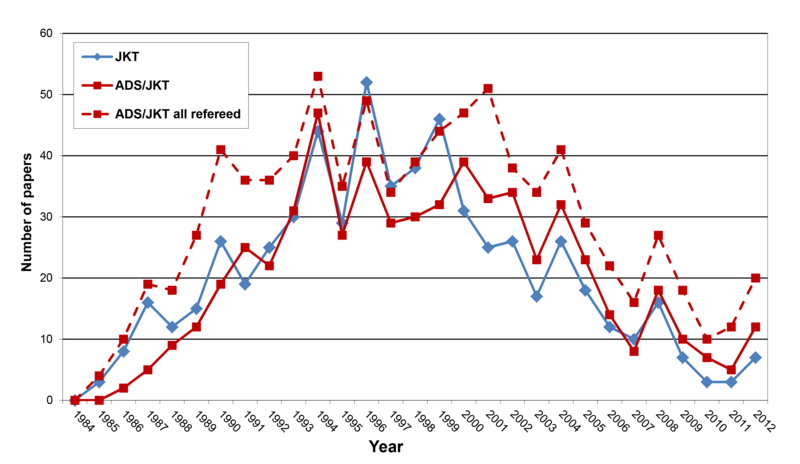 Number of refereed papers per year [ PNG ]. 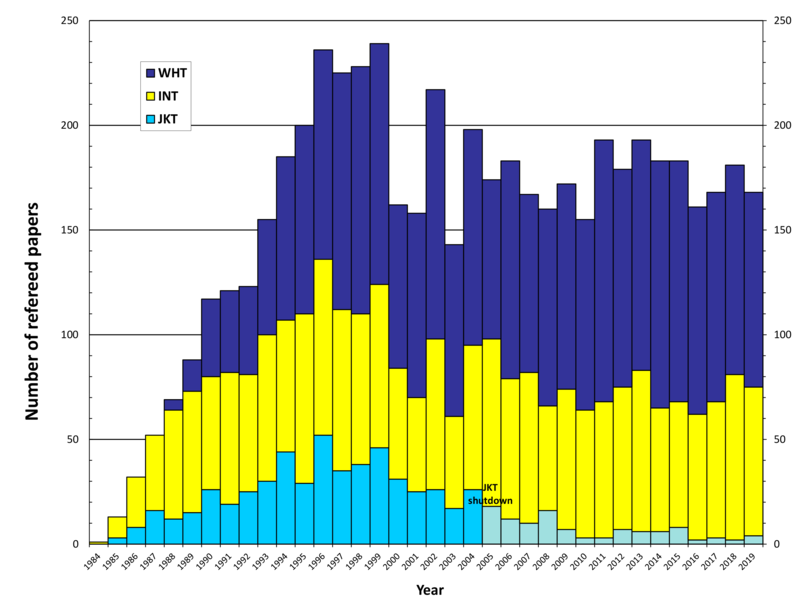 Cumulative number of refereed published papers per year and telescope [ PNG ]. 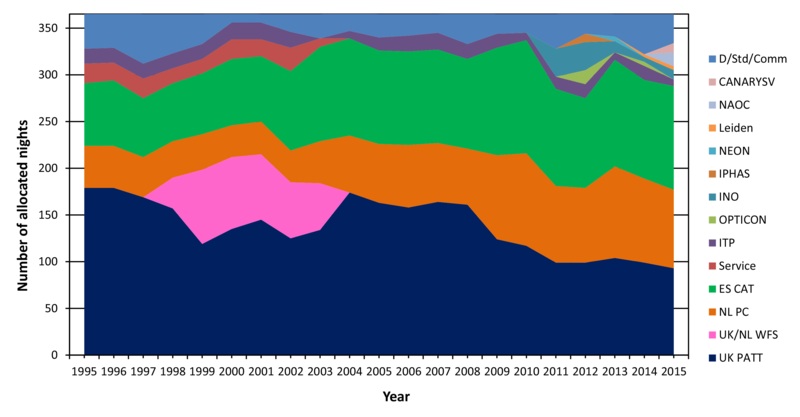 Cumulative number of refereed papers per year from first light [ PNG ]. 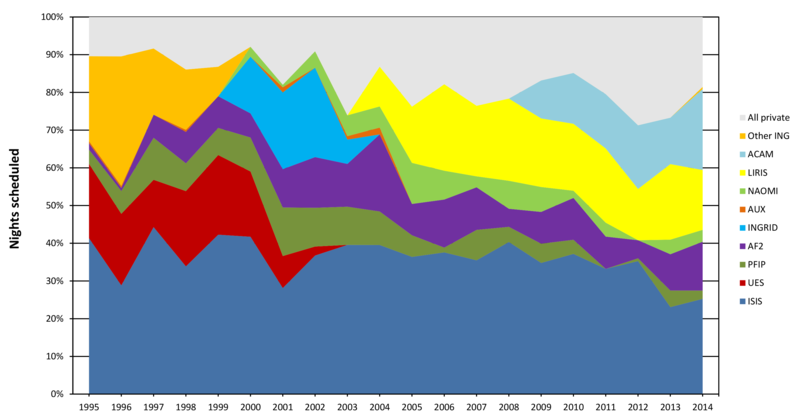 WHT publications and oversubscription statistics (1992-...). "Use of Observing Time and Scientific Productivity (I)", Ian Skillen and Javier Méndez (ING). "Use of Observing Time and Scientific Productivity (II)", Javier Méndez and Ian Skillen (ING). 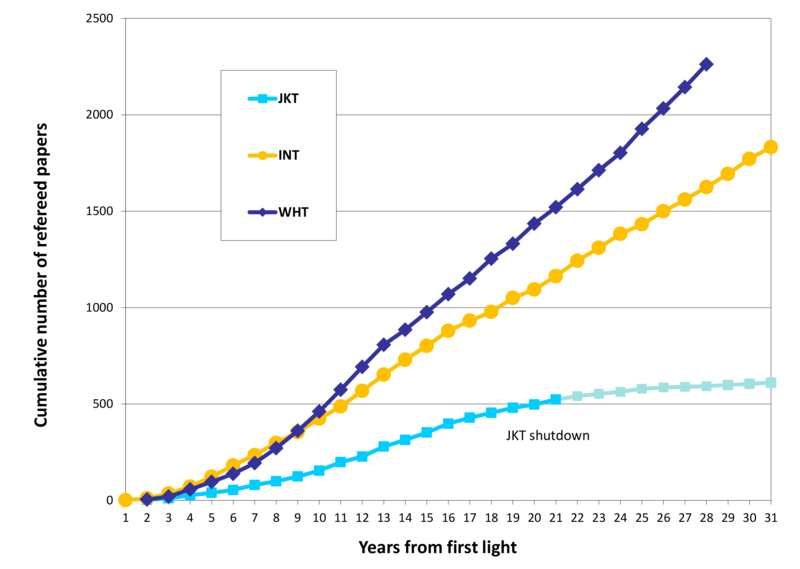 Relative-to-night-length on-sky time defined as 100%-(weather downtime percentage)-(technical downtime percentage) excluding from the calculation S/D/commissioning nights as well as nights when visiting instruments were used [ PNG ]. 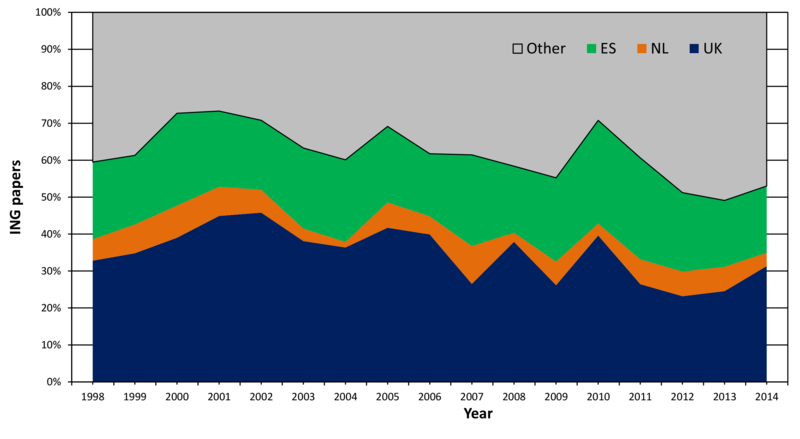 Percentage of technical downtime per semester excluding from the calculation S/D/commissioning nights as well as nights when visiting instruments were used [ PNG ]. 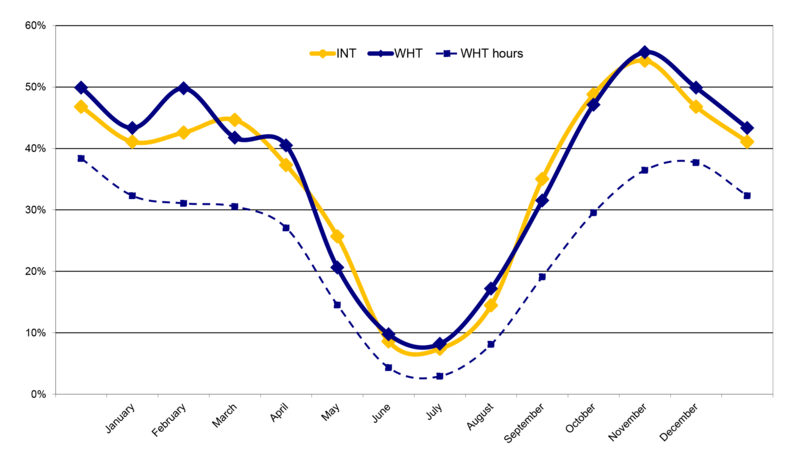 Relative-to-night-length percentage weather downtime per year (semesters A+B) excluding from the calculation S/D/commissioning nights as well as nights when visiting instruments were used. 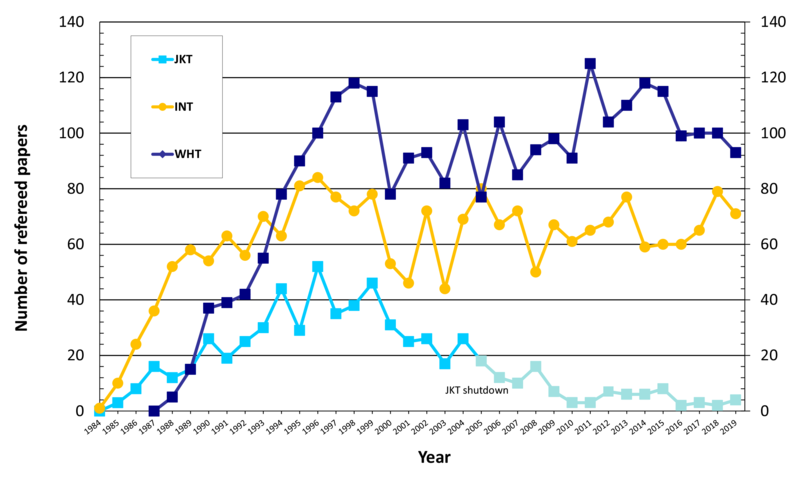 Blue: WHT, yellow: INT. The dotted lines show the average values (WHT average: 24.1%, INT average: 24.0%) [ PNG ]. Relative-to-night-length percentage weather downtime per semester excluding from the calculation S/D/commissioning nights as well as nights when visiting instruments were used. [ PNG ]. 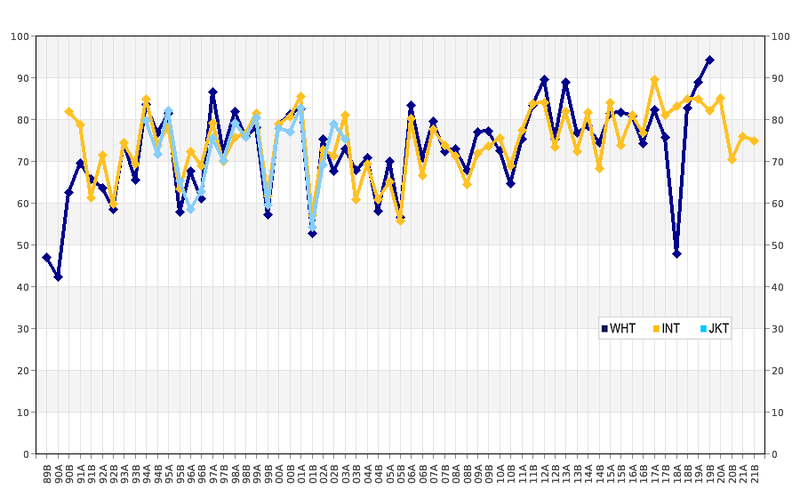 Average fraction of observing time lost to bad weather at the WHT, 1989 to present, and polynomial fit. The average downtime is ~18% in semester A (February to July) and ~27% in semester B (August to January). A shoulder can be seen in February-March which is a characteristic of the climatic condition at the geographical location of the Roque de Los Muchachos Observatory (for comparison, see this article on the climatology of the Izaña Observatory) [ PNG ]. 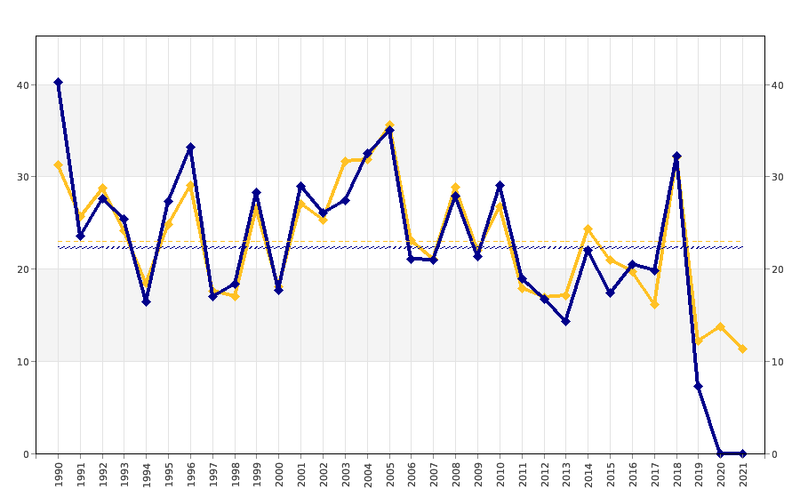 Squares: average fraction of observing time lost to bad weather at the WHT, 1991 to present, excluding the maximum and the minimum values; diamonds: maximum and minimum values; shadow area: one-sigma interval of the average defined above. 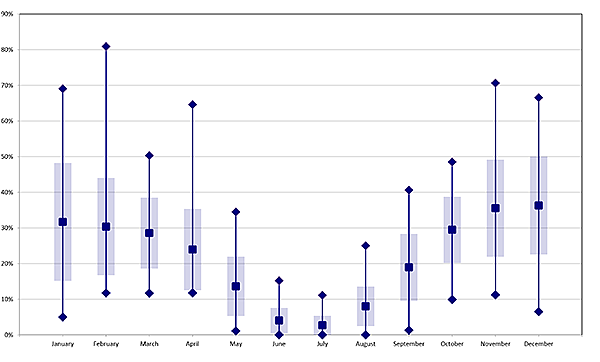 Winter months show higher dispersions and extreme cases than summer ones. July is the most stable month. [ PNG ]. 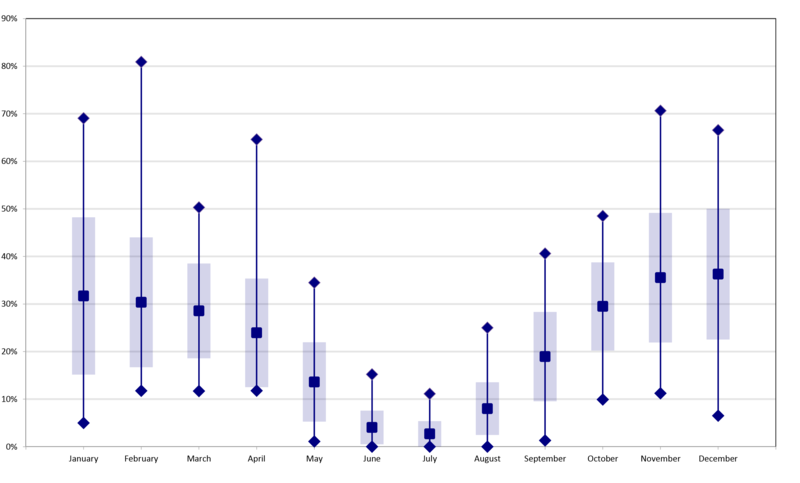 Monthly variation of usable observing time and length of night from 1989 to present. 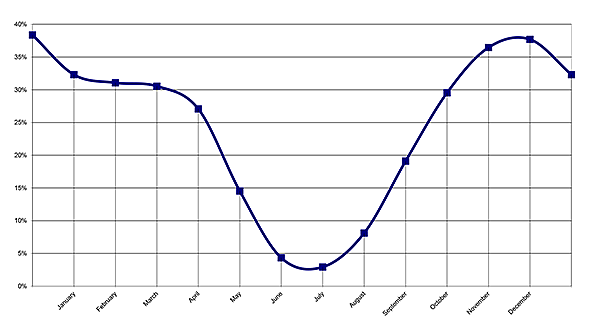 The thick black line represents the duration of astronomical night in hours. The border of the pink area shows the (rather small) monthly variation in the number of hours of good weather available, from a minimum in April, to a maximum in August. Average of usable observing time in semester A is 6.6h and 7.1h in semester B [ PNG ]. 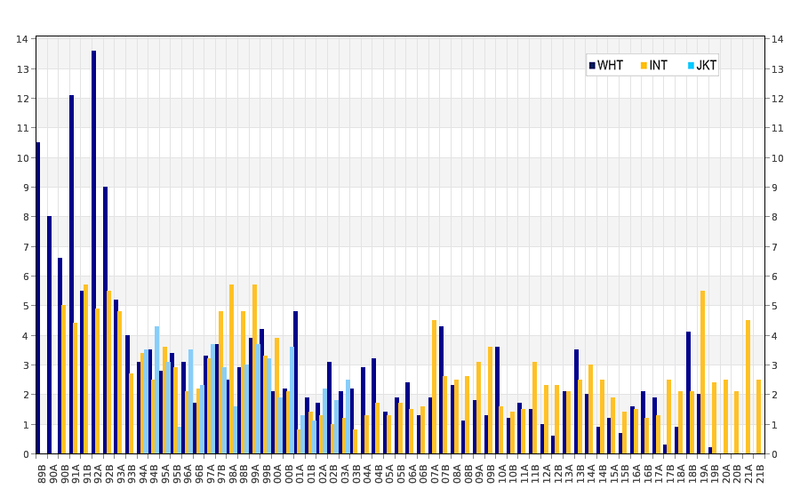 Monthly variation of percentage of nights with some weather downtime from 2002 to present. 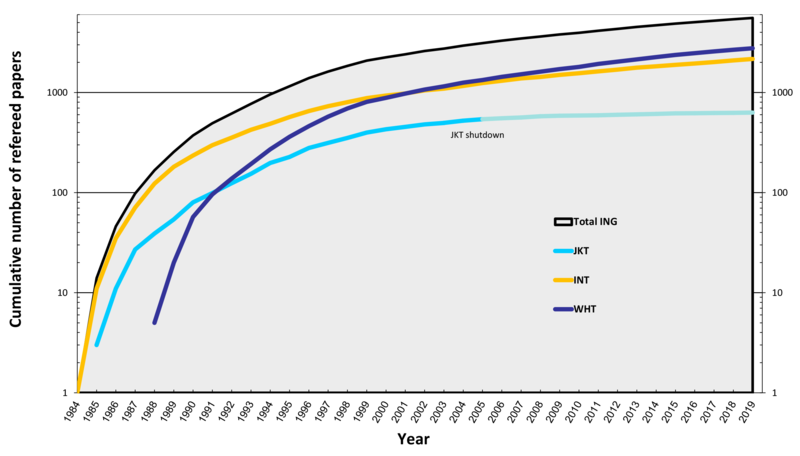 The dashed line shows the percentage of time lost to bad weather on the WHT for reference. More than 40% of the autumn and winter nights have some time lost to bad weather, in summer time less than 20%. [ PNG ]. Number of allocated nights per type of allocation (time allocation committee, observing scheme, organisation, project) [ PNG ]. 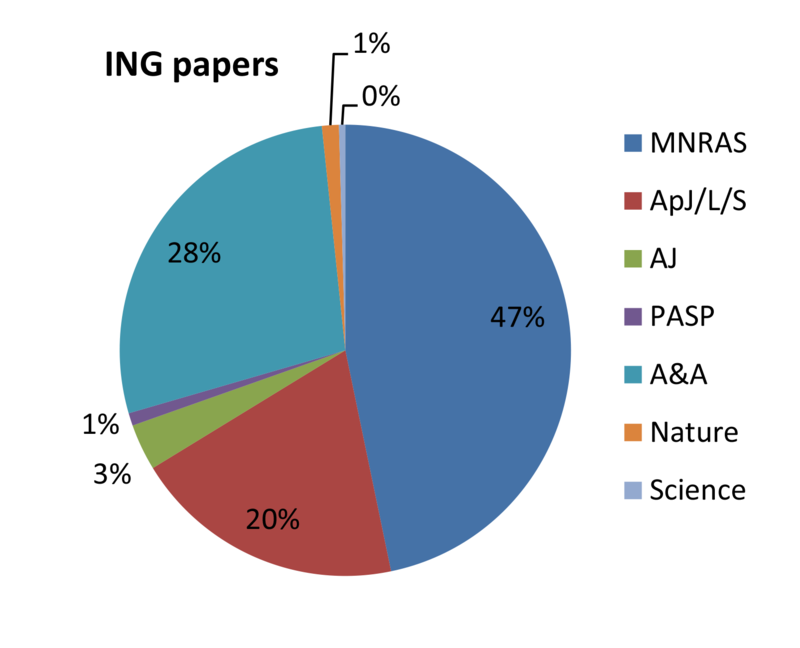 Nationality of first author's main institution in refereed papers that used data from the ING telescopes. [ PNG ]. 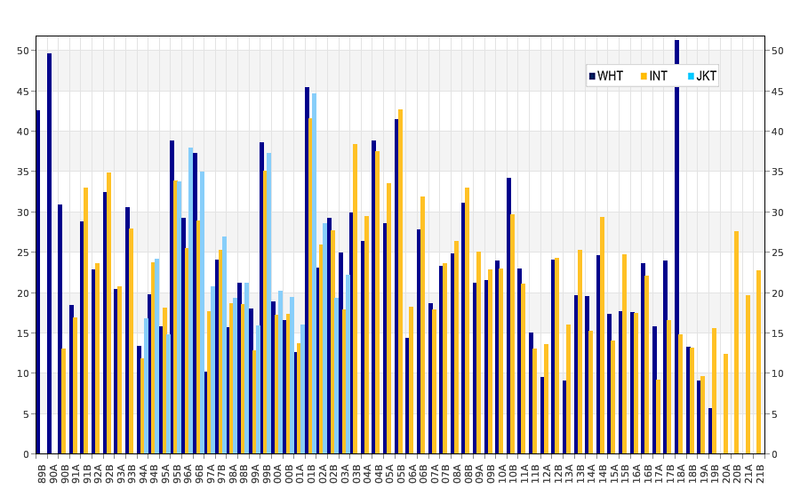 Allocated nights per instrument on the WHT. Only science nights are considered. Every year comprises data from semesters A and B. All private includes INTEGRAL. INGRID refers to when it was used without adaptive optics. NAOMI includes INGRID, OASIS and OSCA in combination with adaptive optics [ PNG ]. Allocated nights per instrument on the INT. Only science nights are considered. Service nights are excluded. 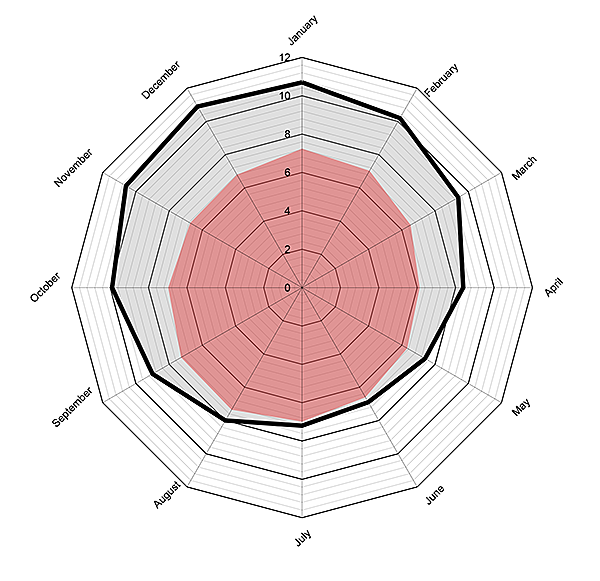 Every year comprises data from semesters A and B [ PNG ]. 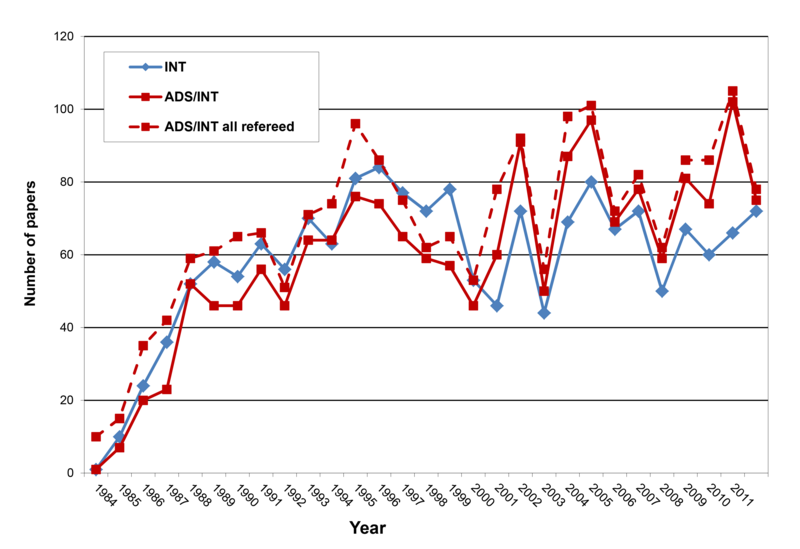 WHT and INT paper distribution in the refereed journals scanned from 2011 to present time. [ PNG ]. 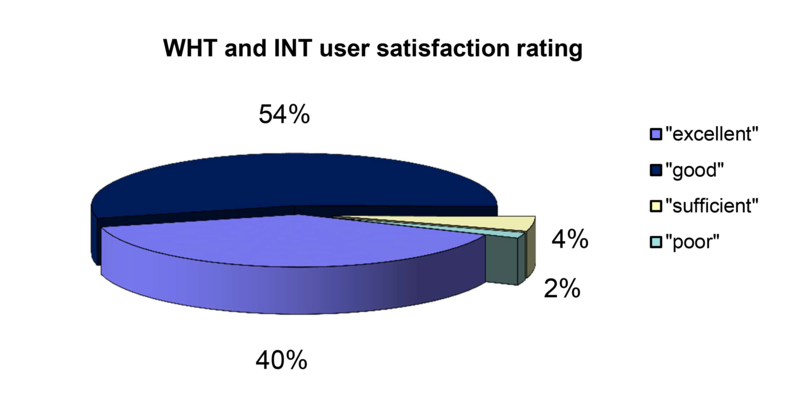 WHT and INT user satisfaction rating, as recorded in the observer feedbacks when they leave, from 1999 to present time. [ PNG ]. 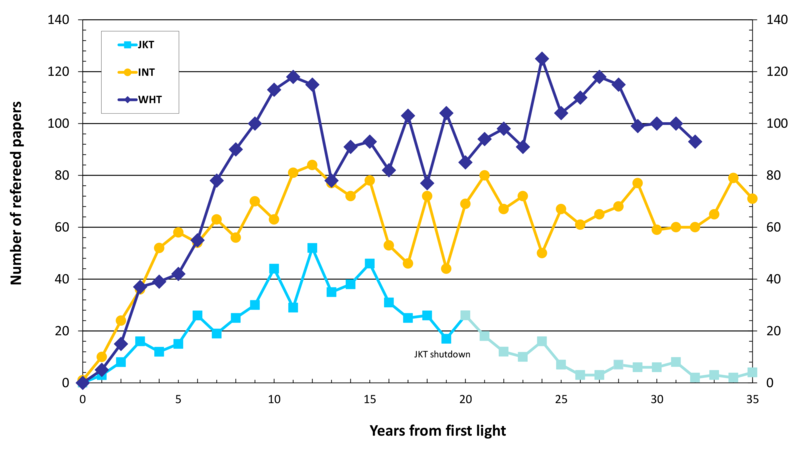 Scientific impact of large telescopes 1991-1998. 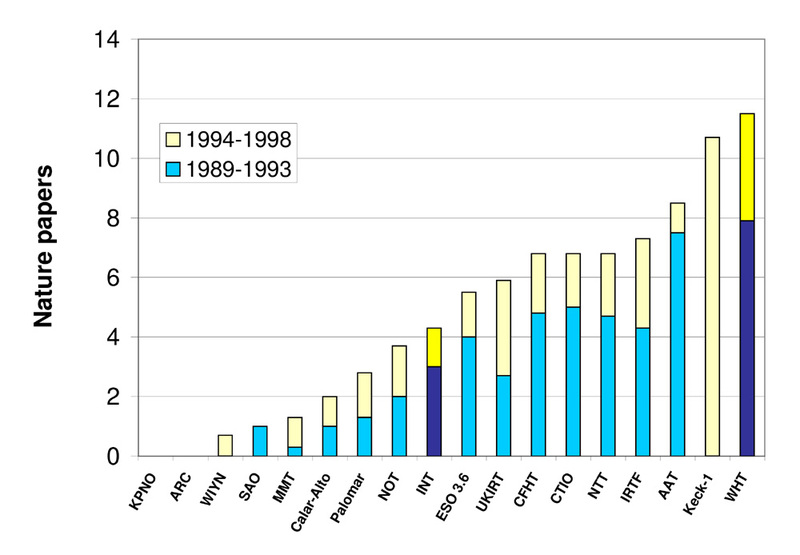 Number of Nature papers generated 1989-98 by ground-based optical telescopes with mirror diameter >3.5m (for comparison, figures for the 2.5-m INT and Nordic Optical Telescope are also included) [ JPEG | TIFF ]. The WHT one of the most scientifically productive telescopes in the world: C Benn and S Sánchez, 2001, "Scientific Impact of Large Telescopes", ING Newsl, 4, 15. Reports from the Red de Infraestructuras de Astronomía. Trimble & Ceja, 2010, "Productivity and impact of astronomical facilities: A recent sample", Astr Nachr, 331, 338. Paper. 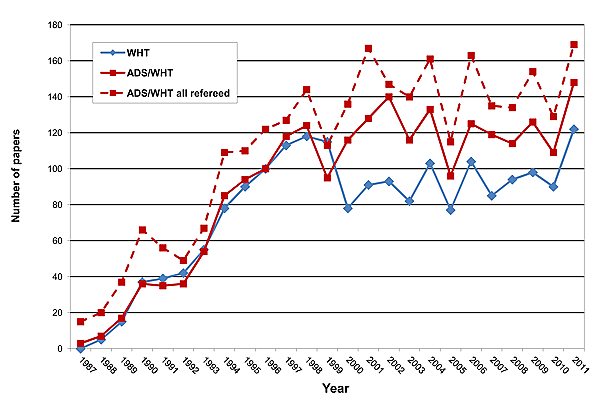 Paper counts by ING (blue) and retrieved from ADSLabs (red, http://labs.adsabs.harvard.edu/fulltext/) as a result of scanning the refereed journals listed below, and searching for a list of specific keywords: "William Herschel Telescope" OR "William Herschel Telescopes" OR "WHT". While the ING counts only include papers that make a direct use of the data, the ADS counts include all the papers that contain the searched keywords. 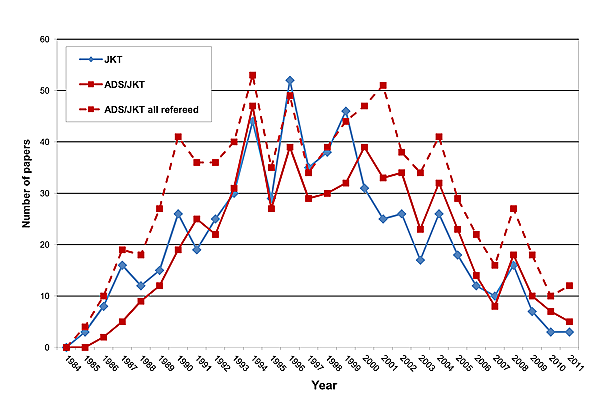 The dashed line shows the ADS paper count but including all the refereed journals in the ADS database [ PNG | TIFF ]. Paper counts by ING (blue) and retrieved from ADSLabs (red, http://labs.adsabs.harvard.edu/fulltext/) as a result of scanning the refereed journals listed below, and searching for a list of specific keywords: "Isaac Newton Telescope" OR "Isaac Newton Telescopes" OR "INT telescope". While the ING counts only include papers that make a direct use of the data, the ADS counts include all the papers that contain the searched keywords. The dashed line shows the ADS paper count but including all the refereed journals in the ADS database [ PNG | TIFF ]. 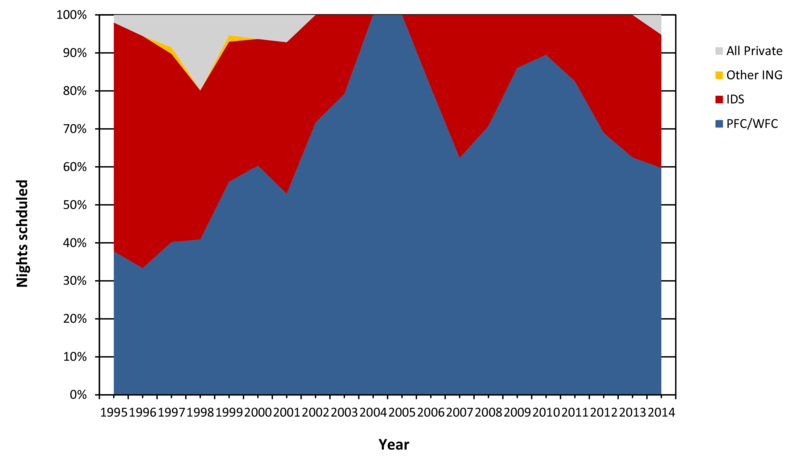 Paper counts by ING (blue) and retrieved from ADSLabs (red, http://labs.adsabs.harvard.edu/fulltext/) as a result of scanning the refereed journals listed below, and searching for a list of specific keywords: "Jacobus Kapteyn Telescope" OR "Jacobus Kapteyn Telescopes" OR "JKT". While the ING counts only include papers that make a direct use of the data, the ADS counts include all the papers that contain the searched keywords. 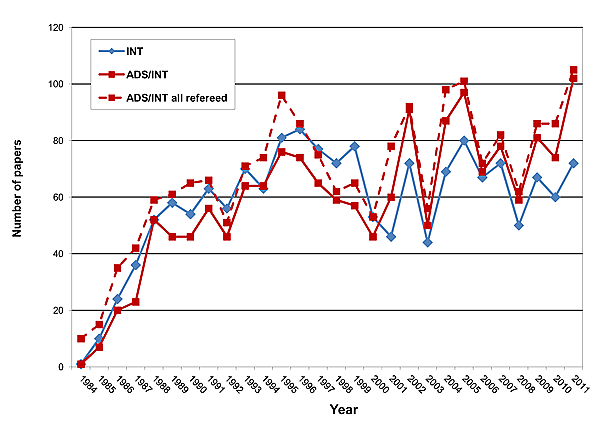 The dashed line shows the ADS paper count but including all the refereed journals in the ADS database [ PNG | TIFF ]. Refereed journals scanned: Astronomy and Astrophysics, Astronomical Journal, Astrophysical Journal (including Letters and Supplement Series), Monthly Notices of the Royal Astronomical Society, Nature, Publications of the Astronomical Society of the Pacific and Science.